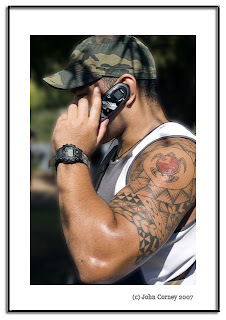 This is an updated version of this photo of a Polynesian guy with a turtle tattoo on his shoulder. On his arms is a traditional shark-tooth pattern tattoo. The earlier version of this photo has proven to be the most popular photo on my website for some reason; I guess people must just love looking at guys with tattoos or are looking for ideas or traditional Polynesian tattoos to copy. This image is also cropped for 8x10 printing since someone recently contacted me about buying an 8x10 print. If you are interested in prints, let me know. I can provide prints in a range of sizes and papers. Here's an article that tells how traditional wood carving by Polynesian races evolved into the carving of the skin in what is now known as the tattooing: The Origins of Polynesian Tattooing. I know this person and the person who did created the tattoo. is a mapping of one's course in life and it provides guidance for one's duty to their culture. The tatatau explains the journey that the individual has accomplished, and must continue to endure as a Tongan. what is this guys name please ?